Whether you are new to making curry, or just looking for an alternative to the standard curry recipe you use, this Sweet Potato Chickpea Vegan Curry is sure to please! This curry recipe is SO easy to make, takes less than 30 minutes to cook, and makes an excellent vegan meal prep recipe! I don’t remember when I first had a vegan curry dish, but I feel like it has always been one of my favorite vegetarian meals. It is just so packed full of both savory and sweet flavors, so creamy, so simple to make, and, because it is always the vehicle for a variety of veggies and proteins like beans, lentils, or tofu, it is packed full of nutrition too! There are a huge variety of vegan curry recipes out there, and I myself have a handful of favorite ways to make it, but this Sweet Potato and Chickpea Vegan Curry is one of my new faves! It really is so quick and easy and is great for a vegan meal prep item because it makes several servings that can be packed up with rice and re-heated in the microwave or on a stove top. 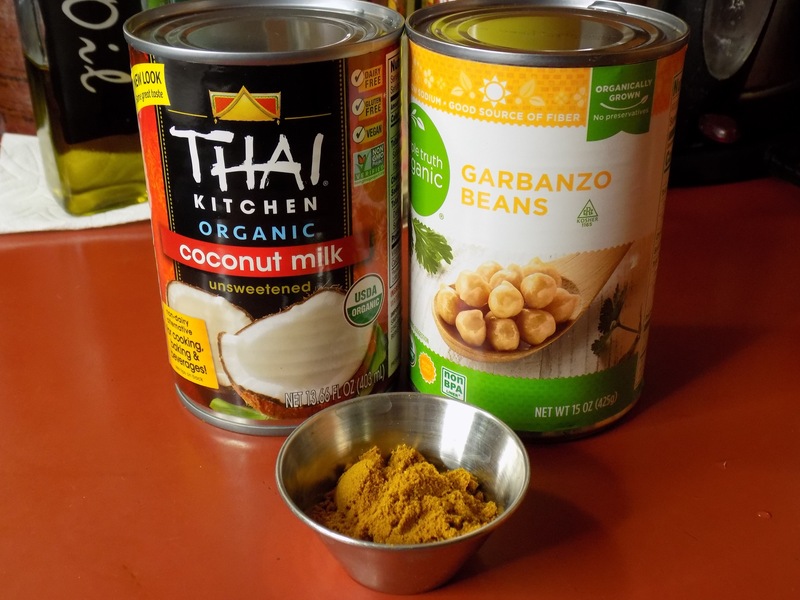 This easy vegan curry recipe features coconut milk as the main sauce component, making it thick and creamy, with a flavor that evokes the most delicious Asian cuisine. The curry flavor here comes from your favorite orange or red powdered curry blend. I used one from Seasonality Spices called Freeport Curry. Their spice blends are amazing, but this is by far my favorite! You can find it on their Etsy shop here https://vegerarchy.com/freeport-curry . 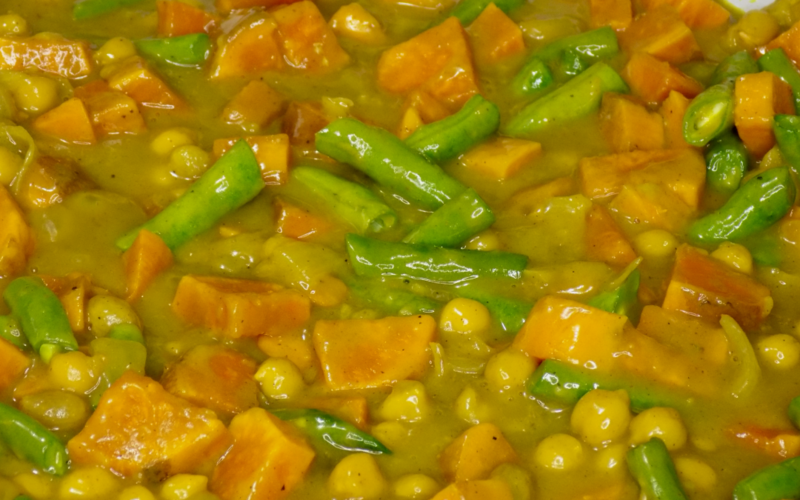 The great thing about vegan curry is that it is essentially a delicious sauce that can be used for a myriad of different vegetables and proteins. Of course, since this is a vegan version of this classic Asian dish, I am using chickpeas, also known as garbanzo beans, as the protein. Sweet potato is another star ingredient, with the addition of green beans to add a little contrasting color and texture. You could add mushroom, or use peas instead of the chickpeas or green beans. Maybe you like zuchinni or tofu – you could add those too! 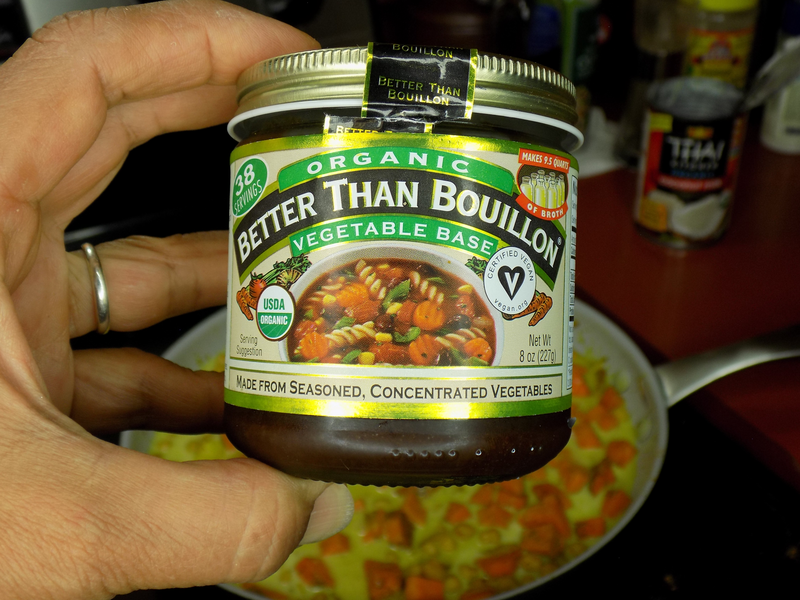 Another ingredient that I have started using recently is this Better Than Bouillon vegetable broth paste. 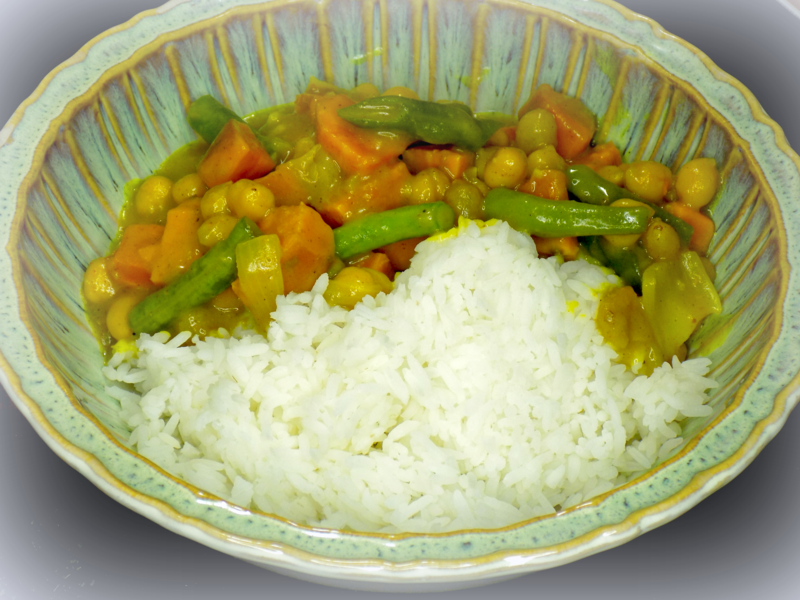 It is really easy to use, is much more convenient than opening a whole container of veggie broth, and really boosted the flavor of this vegan curry recipe up a notch! Just add a teaspoon to a bowl with little bit of water or coconut milk in it, stir to dissolve, then add it to the rest of the coconut milk in the pan. No need to add any extra salt to your recipe! This curry recipe is great for a family dinner, or as part of your vegan meal prep for the week. Serve it in a bowl with rice, or as an addition to a full Indian-style meal. As a meal prep item, add your rice to one side of your reusable (preferably glass) container, filling the other half with the curry. Add a few raw veggies on the side, such as celery, carrots, and cucumber. You can dip them in the curry or just have them as some side crunch! Add a few grapes or other fruit in another container for a sweet after-curry treat! 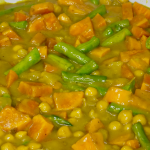 This super tasty vegan curry recipe has great depth of flavor from the curry powder and a sweet creaminess from the coconut milk and sweet potatoes. Super easy to make and great as an easy vegan meal or meal-prep recipe. Put the coconut or olive oil in a large saucepan on medium heat. Add the onions and let cook for 5 minutes until they have started to soften. 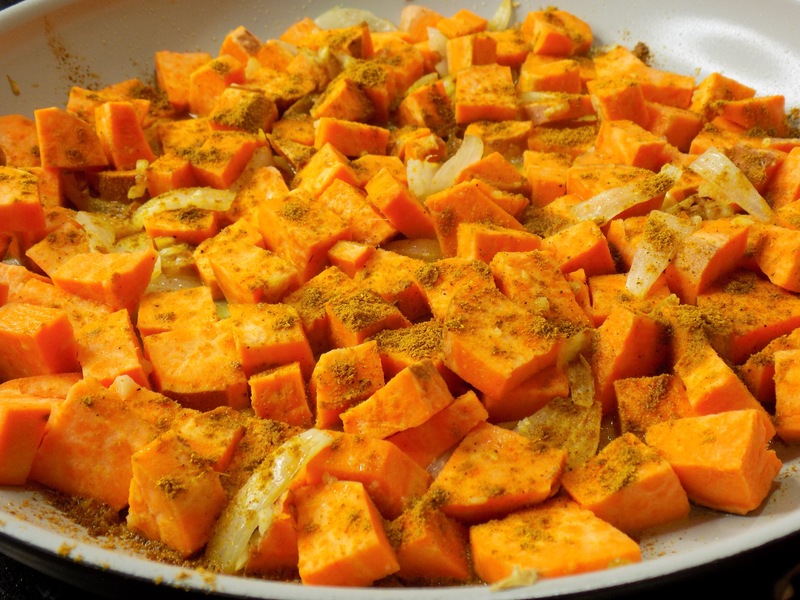 Then add the sweet potatoes, curry powder, and red pepper flakes and sautee for another 5 minutes, stirring frequently. Add the drained and rinsed chickpeas and stir together. In a small mixing bowl, dissolve the Better Than Bouillon in the hot water. If you are using pre-made veggie broth you can skip this step. Add the broth and the coconut milk to the pan with the potatoes and chickpeas. Stir to combine the mixture. *The coconut milk will be much easier to use if you heat the can in some warm water first. This helps to melt the cream that forms at the top of the can. Shake the can well before opening. Cover and lower the heat to medium-low* to let the mixture simmer gently for 10-15 minutes. *Cooking temperatures and times may vary slightly according to your stove, altitude, and other factors. Adjust accordingly. Then add the raisins and green beans and simmer for another 10 minutes. Test to make sure the sweet potatoes are soft. When they are, it is ready! If you want to make this dish more spicy, you can add more red pepper flakes or about 1 Tbsp of Sriracha sauce. You can serve this with rice, couscous, quinoa and/or naan bread.